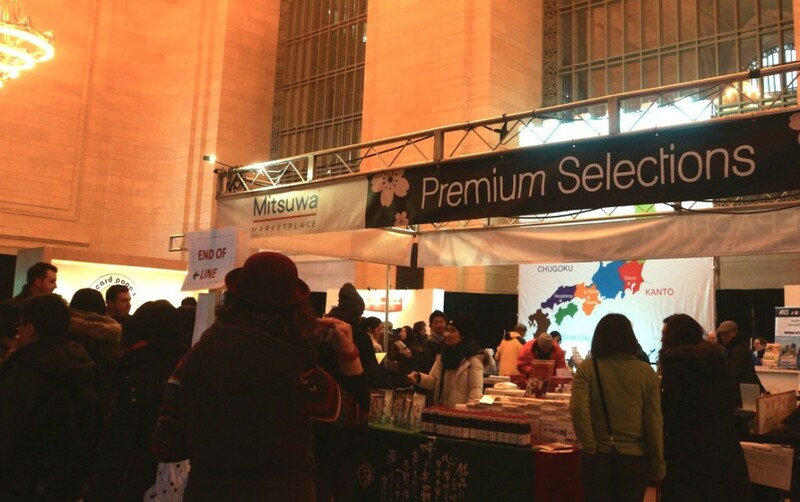 Yes, Japan Week 2015, which was held at Grand Central Terminal February 18 through 20, is not technically a week, but it was long enough to discover new places within Japan to travel, buy our favorite sweets and street food, and check out traditional and contemporary Japanese fashion. 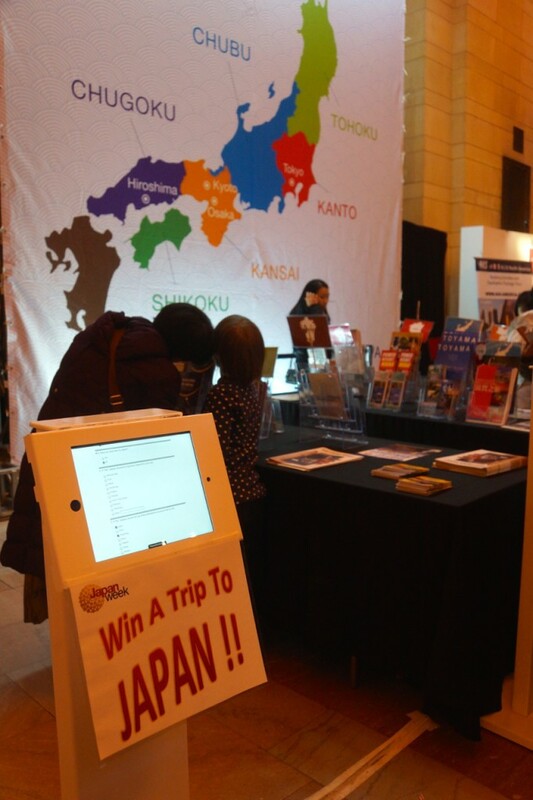 The primary purpose of Japan Week is to increase tourism to Japan. Thirteen million people visited Japan last year, up three million from 2013. But the Japanese government isn’t settling on that achievement; Japan wants to attract at least 20 million foreign visitors by Tokyo’s Olympic year of 2020. 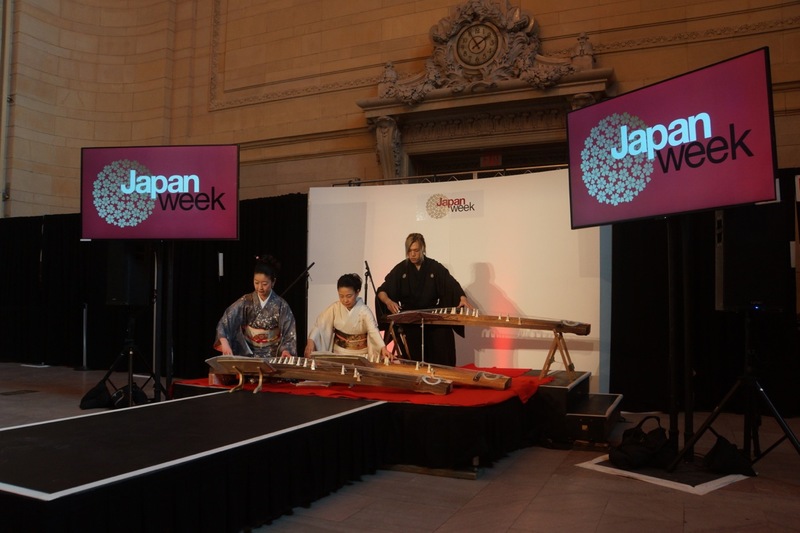 According to Yuki Tanaka, Executive Director of Japan National Tourism Organization‘s New York office, Japan Week is the agency’s largest consumer event in the US. 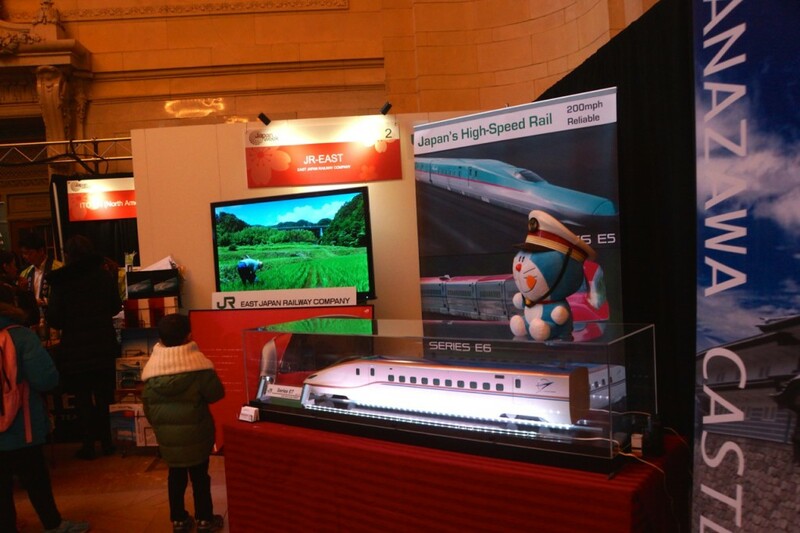 With sponsors such as NHK World, Seiko, Sharp, and East Japan Railway and family-friendly activities such as photo ops with popular television characters Domo and Doraemon, Japan Week enticed passersby at Grand Central Terminal to explore the possibilities of a getaway to Japan. Local travel agencies Amnet, H.I.S., and IACE Travel, which specialize in Japan travel, were on hand to provide pamphlets and advice to anyone interested in becoming one of those 20 million foreign visitors. While these agencies assist many Japanese nationals in New York with their travel plans, they also offer tours and packages to first-time travelers. Rachel Mimms of H.I.S. says that during the three days of Japan Week, she spoke to people who have never been to Japan and were curious about the culture as well as people who have traveled there and are eager to return. Grand Central was set up somewhat like the department stores you’ll find across Japan, with information an booth staffed by young ladies dressed in uniforms. One side of Vanderbilt Hall was dedicated to shops and a stage for performances, while the other was the “depachika,” or food market that is typically found in the basement of large department stores. The Japan Week depachika was dedicated mainly to sweets from Hokkaido to Okinawa. Mitsuwa was there with dashi and tsuyu, and there were regional bento that sold out quickly. Other popular items that didn’t take long to see out were the grilled sweet potatoes from La Poppo, miso products from Marukome, and Sun Noodle’s ramen kits. Long lines dominated the depachika, particularly for takoyaki by Kukuru, a famous restaurant in Osaka, and for cream puffs by Beard Papa’s. The depachika wasn’t an exact replica of what’s in the basement of the Takshimaya in Shinjuku, but it was a nice snapshot. This lady waited in line for takoyaki, saying that her niece is a huge fan of Japanese food and culture. Her niece couldn’t be there, so she filled in for her, reaping the benefits of the delicious octopus snack. 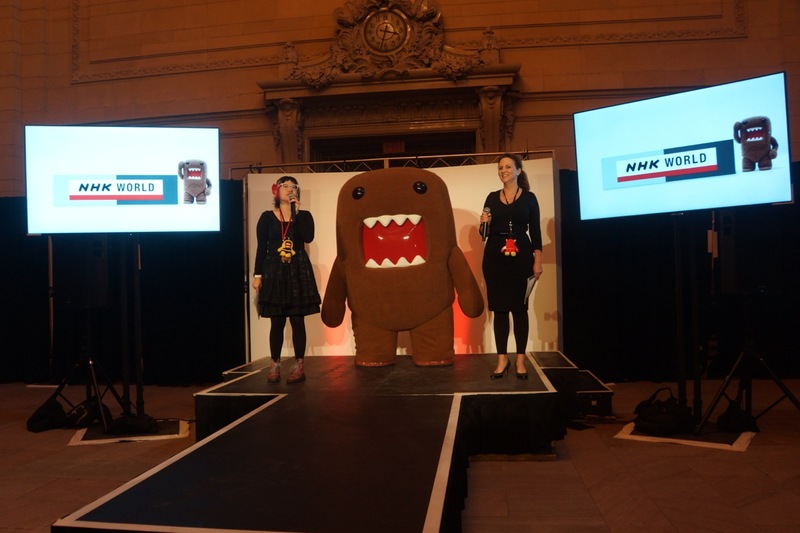 Frequent appearances by Domo, the official mascot of Japanese public TV broadcaster NHK, was the highlight of Japan Week. 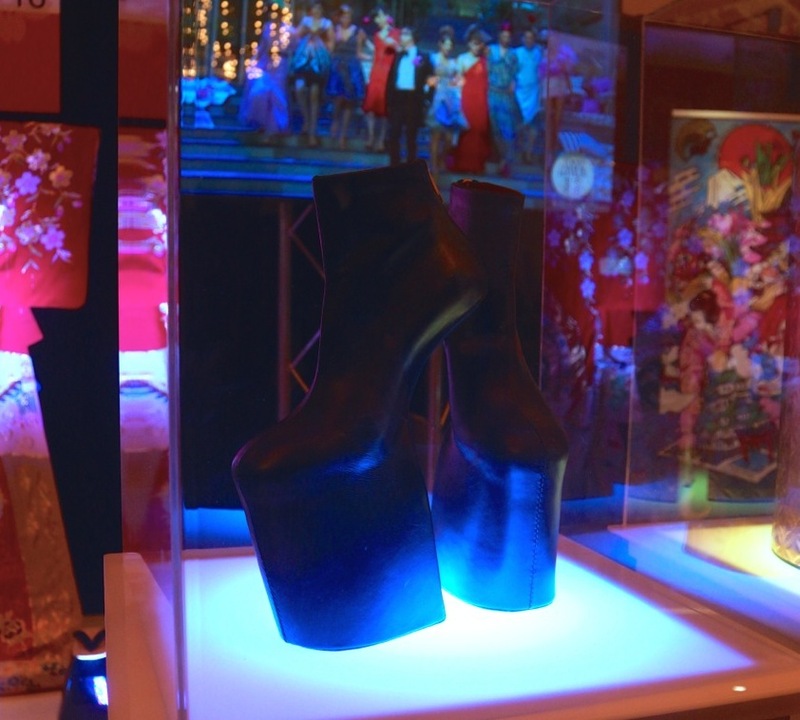 People of all ages mobbed the rectangular creature with the perpetually open mouth to pose for pictures on stage and at NHK World‘s booth, which also displayed a couple of Lady Gaga’s heelless platforms designed by Noritaka Tatehana. 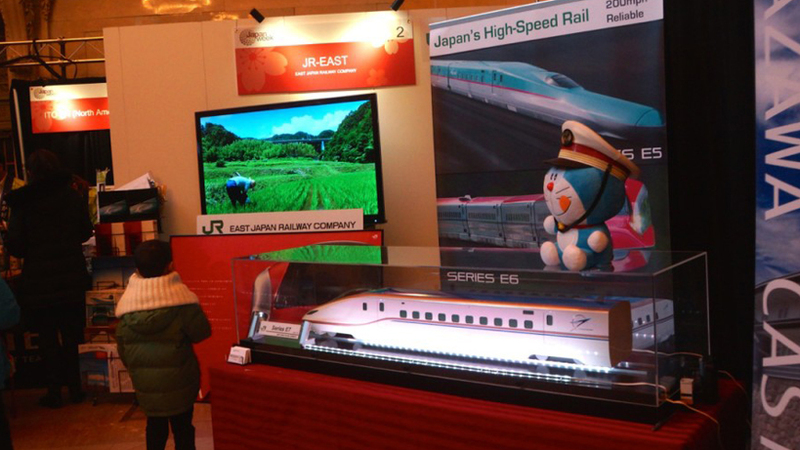 Doraemon, another famous Japanese character, was all over Vanderbilt Hall, providing the same photo ops as well as endorsing tofu for House Foods, cream puffs for Beard Papa’s, and JR East Railway‘s newest shinkansen to Ishikawa Prefecture. Visitors to Japan tend to love the traditional aspects of the ancient culture, and one feature of Japan Week centered on luxury wedding kimono provided by Watabe Wedding of Japan. Emi Kikuchi, a certified master kimono dresser and teacher based in New York, dressed three lucky couples, chosen as finalists out of more than 130 entries, in the traditional kimono during the three days of Japan Week. You can vote for your favorite couple until Tuesday, March 3 at Japan Week’s website. The couple with the most votes will win a romantic vacation in Japan! 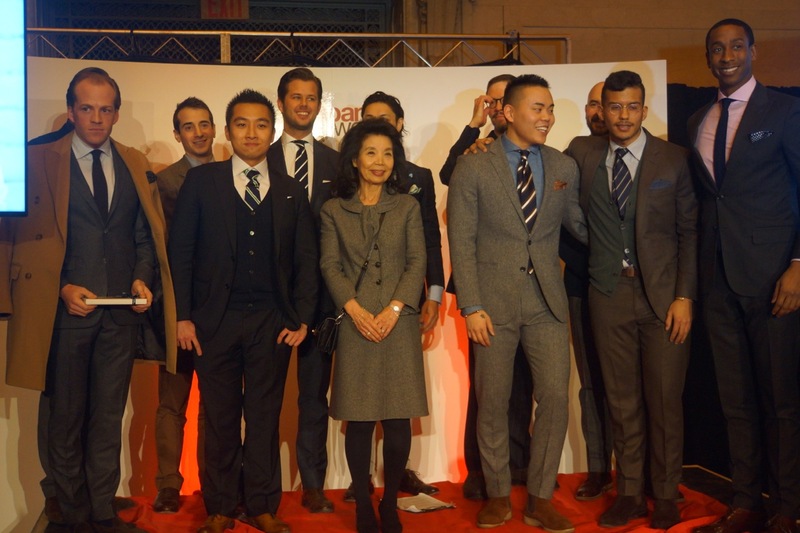 Kamakura Shirts ended Japan Week in style with a fashion show featuring ten of the Madison Avenue clothier’s most loyal customers. The men dressed themselves to their own personal tastes and chatted with the audience about their love for the Japanese brand. The winner, selected by audience applause, was Sebastian, looking dapper in his camel hair coat, received a gift card from Kamakura Shirts for one of their signature Made to Measure shirts. All of this food and fun makes you want to go to Japan, right? But if you’re unable to hop on a 13-hour flight to Narita at the moment, you can rest easy knowing that the majority of the products and services at Japan Week – or reasonable facsimiles – can be found right here in New York. 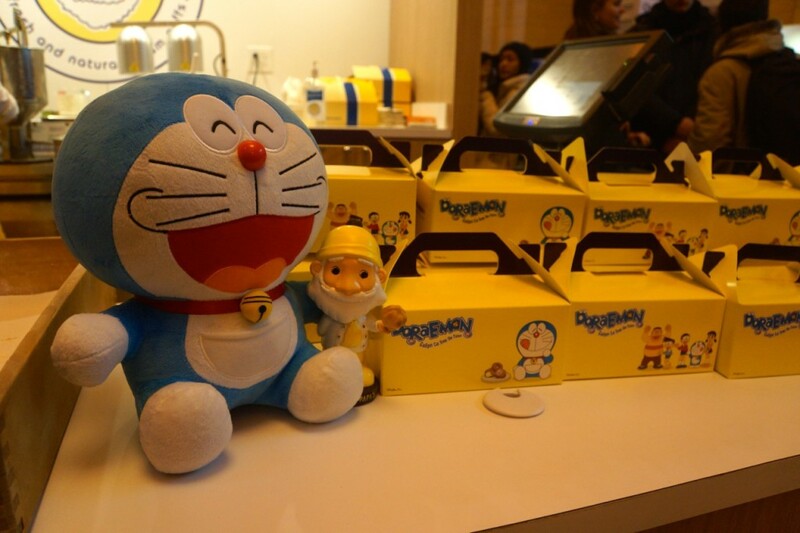 The tofu maker is having a Doraemon Sweepstakes until March 15! 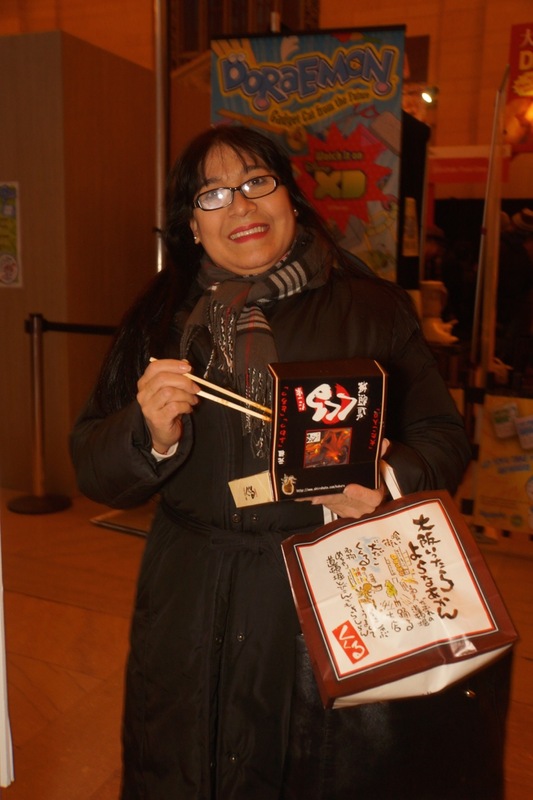 Despite frigid temps, visitors to Japan Week 2015 ate Ito En’s green tea ice cream like it was the middle of July. One of the most versatile Japanese condiments is readily available in NYC. Wagashi, traditional Japanese sweets, are as beautiful as they are delicious. Just across the Hudson River is Mitsuwa Marketplace, a large Japanese grocery store with practically everything you would want, including a food court. The ramen noodle maker’s factory is in New Jersey, but you can find ramen kits for home cooking at grocery stores. Want the pros to make your ramen for you? Head over to their recently opened Ramen Lab at 70 Kenmare Street. Kukuru is located in Osaka, but you can find authentic octopus balls at various NYC izakaya and Otafuku at 220 E. 9th Street and Mimi and Coco‘s variations on the takoyaki theme at 92 Rivington Street. 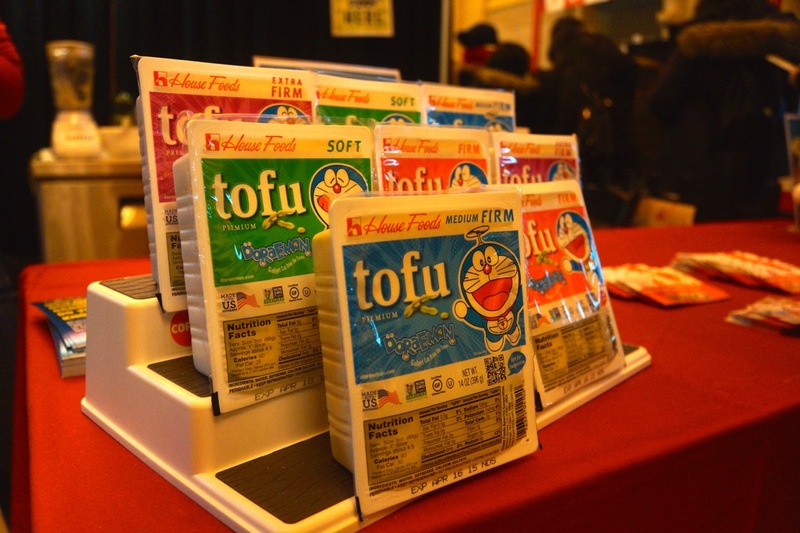 Food is essential, but so are fine Japanese-made products. We’re fortunate that we have these great shops and services in New York. Part of artists networking group J-COLLABO, this multi-brand showroom sells high-quality products from Japan. The group brought the Takafuji family to perform as well as showcased artisans from Kyoto and Ishikawa Prefecture during Japan Week 2015. 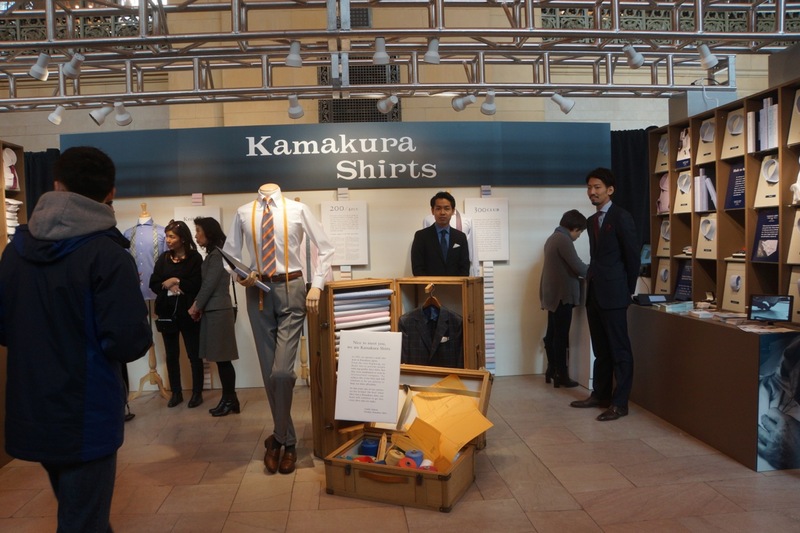 If you didn’t know before the fashion show at Japan Week 2015, Kamakura Shirts makes upscale shirts at an affordable price. But the main message that the models/customers delivered was that the customer service is excellent. Watabe Wedding is located in Japan, but if you want to dress in wedding kimono – or any other kind of kimono, for that matter – contact Emi Kikuchi at Kimono Experience. Or you could register to take kimono dressing classes at Kaede. To purchase kimono, visit Kimono House at 131 Thompson Street or Kyotoya at 23 W. 19th Street. One of the oldest watch companies in the world had its Astron GPS watch on display and for sale (between $1,800 and $3,000) at Japan Week 2015. Its boutique holds several events, including a takeover by soccer legend Landon Donovan on March 12 at 6:00 p.m.
For all of the news from Japan in English and heavy doses of Domo, watch NHK World on Time Warner Cable 223, Comcast 265, Verizon Fios 482, and WRNN 48.5. Did you take a picture with Domo? Find it on NHK World’s Facebook page. It may take you a while; there are more than 1,000 pictures. The cat-like robot from the 22nd century is everywhere – because of his Dokodemo Door, no doubt. He’s Japan’s anime ambassador, appearing on tofu and cream puff packages and riding the bullet train, and now you can watch his English-language show on Disney XD. 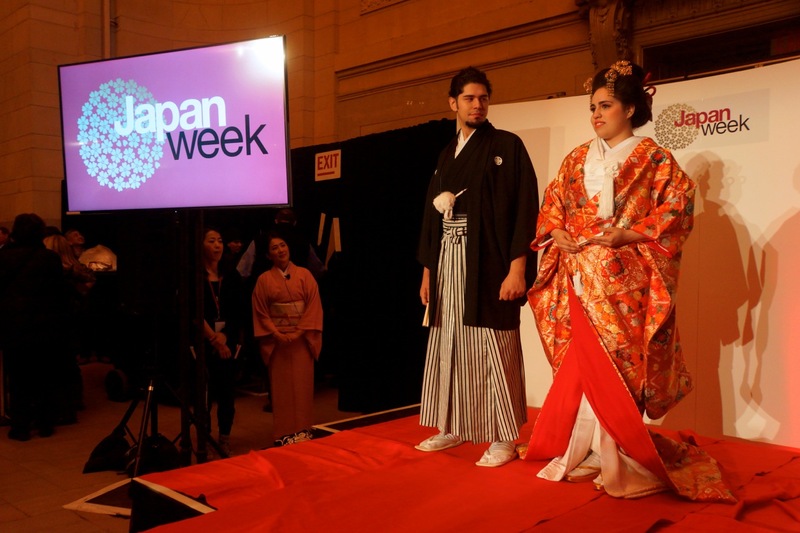 To see more pictures from Japan Week 2015, please visit JapanCulture•NYC’s Flicker page.